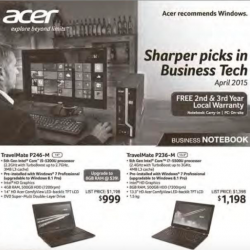 Sharper picks in Business Tech April 2015. 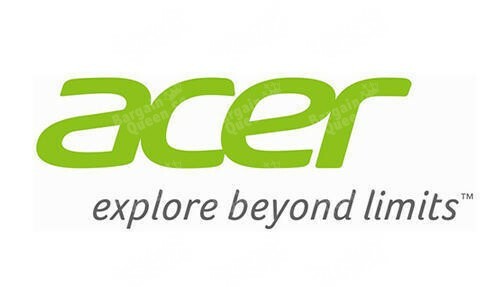 Acer offers business pc and notebook promotion: Travelmate P246-M @ $999 (LP: $1,198), TravelMate P236-M @ $1,198 (LP: $1,398), Veriton M2631 @ $1,199 (LP: $1,399) and Veriton X4630G @ $1,299 (LP: $1,499). So hurry now and don’t miss this out! 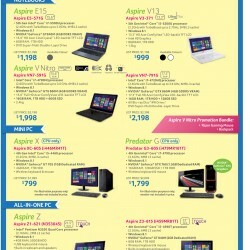 Best Tech Deals at IT Show 2015 on Suntec Singapore, Levels 3, 4 & 6│19-22 March 2015, 12pm-9pm. 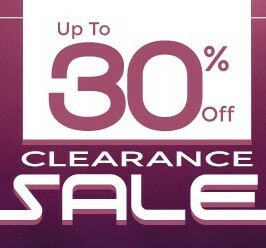 Enjoy Acer & Asus Clearance Exclusively @ Century Square with Up to 30% discount for selected models.